The Fire Sentry SS4 Electro-Optical Digital Flame Detectors represent leading edge UV/IR technology. The Fire Sentry SS4-A represents the world's pre-eminent UV/IR technology for electro-optical flame detectors with tens of thousands successfully operating in a multitude of installations worldwide. This multi-spectrum detector senses radiant energy in the ultraviolet (UV), visible and Wide Band Infrared™ (IR) spectrum. The radiant energy from all types of flaming fires will alert the detector to their presence. The Fire Sentry SS4-AUV represents the leading edge technology UV optical flame detectors. 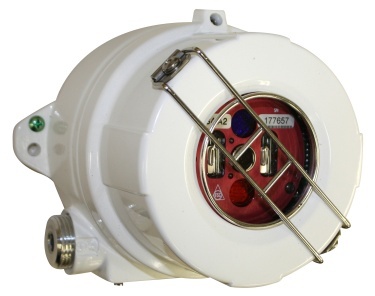 This flame detector senses radiant energy in the ultraviolet (UV) spectrum. The radiant emissions of flaming fires will alert the detector to their presence. The Fire Sentry SS4-AS processes UV, IR and Visible (Vis) spectral ranges from rugged solar-blind UV, quantum-effect IR and VIS sensors correspondingly. It is optimized for detection of hydrogen, ethanol, methanol and methane (natural gas) fires and like the other detectors in its family, it responds to Type A, B and C flaming fires.